In today's "You're a Dumb MFer News," aspiring rapper Kasper Knight proved that his stupidity has no bounds. 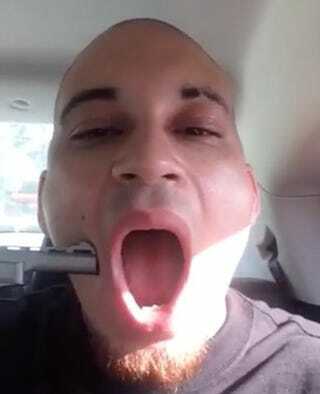 The Indiana rapper decided it would be a grand idea to shoot himself through the cheek to gain interest in his music. And, of course, he posted the video on Facebook. Even after shooting himself, he continued to talk through the video. He spoke about "The Fleshy Part of the Thigh" episode of the The Sopranos (TV will have you f—ked up), in which a rapper wanted to gain fame after having one of the mob dudes shoot him. Warning: This NSFW video contains content that some may find offensive. The only thing I could think of was Darwin and natural selection. As for the fame part? Remember that scene from the horror movie Carrie where her mother is like, "They're all gonna laugh at you"? Yeah … that.